Menopause is a period when a female body is undergoing physiological changes within estrogen levels, which may lead to such symptoms as hot flashes and night sweats. Not everyone is aware that these natural hormonal changes may also affect other body parts, e.g. bones, skin, or the nervous system. Vitamin D, B6 and folates (including folic acid) – contribute to the normal function of the immune system. 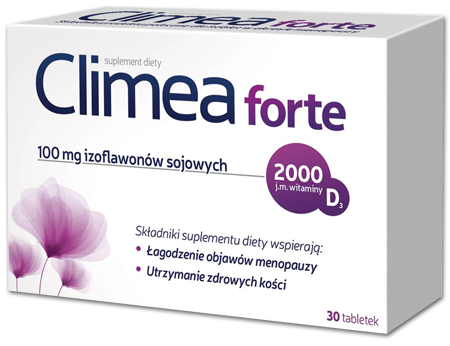 Climea Forte dietary supplement contains 5 µg of vitamin D – 100% of the reference daily intake. Convenient – only one tablet per day. Supplies calcium and vitamin D, which support bone health. Is a natural process that affects every woman. During menopause, the ovary function in the female body starts to decline, which leads to the physiological reduction of the estrogen level. The ovary aging process begins at birth and lasts for the entire life. It is assumed that the reproductive period stops 5-10 years before menopause. It is considered that menopause starts with the last menstrual period, with no menstrual bleeding within at least 12 months afterwards. The average menopause age is estimated between 48 and 52 years old, while the average menopause age in Poland is 51. The process lasts around 4-6 years. A period when the ovary function starts to decline until the complete cessation of ovarian cyclicity. The period lasts from full fertility to menopause, 5–6 years on average. A temporary period before and after menopause (it begins shortly before the last menstrual period and lasts around a year afterwards) This is when most women start to experience most of the symptoms related to menopause, such as hot flashes, mood swings, weariness. A period that starts after the last menstrual period. This is a phase when the ovaries ultimately stop functioning. It lasts until around the age of 65. When menopause is over, a woman no longer has menstrual periods. 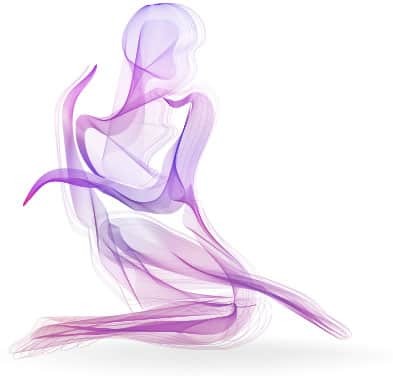 Around the age of 65, a woman’s body is fully adapted to the hormonal changes that have taken place in the body and most menopausal symptoms cease to occur. Are you concerned about changes in your body you have recently noticed? Or maybe recently you have been constantly weary and absent-minded? If you are not sure whether you or a person close to you are/is entering menopause, take the following test and allay your doubts. Test - Is it menopause already? Menopause affects every woman, it is a process that ends the reproductive period. The number of women in menopause grows every year. Thanks to the developments of modern medicine, life expectancy has been considerably extended; in Poland, it is now 79 years old. This means that postmenopausal period accounts for 1/3 of an average woman’s life. At the moment, around 3 million women in Poland are experiencing menopause. The effects are related to the content of soybean and hop cone extracts, which help alleviate menopausal symptoms, such as hot flashes, sweating, anxiety, and irritability. The effects are related to the content of linseed, which helps reduce appetite. The effects are related to the content of calcium and vitamin D, which help maintain healthy bones. The effects are related to the content of vitamin B6 and folates (including folic acid), which support the proper function of the immune system and contribute to reducing exhaustion and weariness. Source: Based on data from the Omnibus database of PEX PharmaSequence November, 2018. "Wpływ menopauzy na starzenie się skóry", D. Wojnowska, M. Juszkiewicz-Borowiec, G.
"The role of physical activity in menopause", J. Dąbrowska, B. Naworska, M. Dąbrowska-Galas, V. Skrzypulec-Plinta, in: "Menopause Review" 2012; 6; pp. 445–448. You, user – person visiting the climea.pl website. Owner of the website at climea.pl – Aflofarm Farmacja Polska Sp. z o.o. with its registered office in Pabianice (95-200) at ul. Partyzancka 133/151, entered into the Register of Entrepreneurs maintained by the Łódź-Śródmieście District Court in Łódź, 20th Division of the National Court Register, KRS (National Court Register Number): 0000014115, share capital: PLN 26,271,500, NIP (Tax Identification Number): 731-18-21-205, REGON (National Official Business Register Number): 472871255, hereinafter referred to as “Aflofarm”. Your personal data are processed by Aflofarm in accordance with Regulation (EU) 2016/679 of the European Parliament and of the Council of 27 April 2016 on the protection of natural persons with regard to the processing of personal data and on the free movement of such data, and repealing Directive 95/46/EC (General Data Protection Regulation – “GDPR”). any other information you provide via the contact form, if available on the website, or by e-mail. handling complaints – legitimate interest of the Controller – Article 6(1)(f) of the GDPR. The basis for personal data processing will be Article 6(1)(b) of the GDPR, where necessary to perform a contract to which you are a party or to take steps at your request prior to entering into a contract. Your personal data will be received only by (1) authorised personnel of Aflofarm and authorised persons acting for Aflofarm as well as (2) entities acting for and on behalf of Aflofarm, i.e. external entities delivering and supporting the ICT systems of Aflofarm (general ICT infrastructure, e-mail and IT systems used by Aflofarm), (3) authorities monitoring compliance with the law, state authorities and other public authorities or third parties, where required by applicable regulations, (4) certified auditors and other professional consultants. If your personal data are processed based on your consent, you may withdraw your consent to personal data processing at any time, whereas this will not affect lawfulness of prior processing. By using the Website, you consent to receive marketing materials that are an integral part of the Website. Integral parts of the Website include, for instance, banners, where Aflofarm may promote its services and products or other advertising contents. You have the right to access your data, rectify them or erase them at any time as well as the right to restriction of processing, the right to object and the right to data portability. All statements concerning the exercise of your rights should be sent to the following e-mail address: daneosobowe@aflofarm.pl. If, despite our assistance, you find that your personal data are processed contrary to the applicable law, you may file a complaint with the supervisory authority (i.e. President of the Personal Data Protection Office). Matters not regulated herein shall be accordingly governed by relevant law. What are cookies? Cookies are small text files kept on your computer, smartphone or other device (hereinafter referred to as the “Terminal Device”) that can be used to record the flow of information between a website and the browser. They serve a number of functions that affect the convenience of web browsing. Cookies usually contain the name of the web page they are taken from, the time of storage on the Terminal Device and a unique number. analyses, statistics, surveys and audits of Website visits. Session cookies – active only when you are browsing the Website; they enable correct functioning of the Website. Persistent cookies – they remain on your Terminal Device after you visit the Website, which means that the Website can save your settings. This makes the Website easier for you to navigate, and it saves your preferences. Such files are kept on your Terminal Device for the period specified in their parameters or until you delete them. Third-party cookies – they can be used, in particular, to determine your preferences and, consequently, display suitable ads for you on the websites of external partners. They are also used to measure traffic on a particular web page. How to disable cookies? Normally, the software used to browse website enables saving cookies on your terminal device. You may change the cookie settings at any time. You have to make suitable changes in your web browser settings in order to disable automatic cookie handling in your browser settings or be notified whenever cookies are placed on your device. For detailed information about the options and methods of cookie handling, refer to the settings of your software (web browser). However, if you change your browser settings, you may experience problems with the functioning of the Website and access to its resources. What do you need to know? Information about you is automatically collected when you use the Website. Such information includes the following: IP address, domain name, browser type and operating system type. This information may be collected through cookies or via cookies from the following providers: Google Analytics, Facebook, HotJar and Megiteam, and it may be saved in server logs.